Fill in the form to have your TAFE Library PIN emailed to you, or contact your local TAFE Library to have one set up. by completing the Library Feedback form. We love hearing what you think! The Glendale library collection includes a wide range of information resources; including books, academic journals, magazines, DVDs, e-books, and streaming videos. Internet access and WiFi is available to students. The collection specializes in the subject areas of Early Childhood, Automotive, Business, Networking, Health and Community Studies, Foundation Skills, and Electrical Engineering. 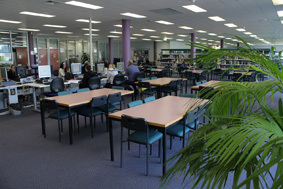 Experienced TAFE Library staff are on hand to offer professional assistance with locating appropriate information resources for your course. Contact your local TAFE library, or type your question into the search box below and we will reply as soon as possible. TAFE students can access the Wireless network in all TAFE NSW Libraries. Follow the instructions in the guides below to set up the connection on your mobile device. Ask Library Staff if you need assistance.